OPEN ALL YEAR. 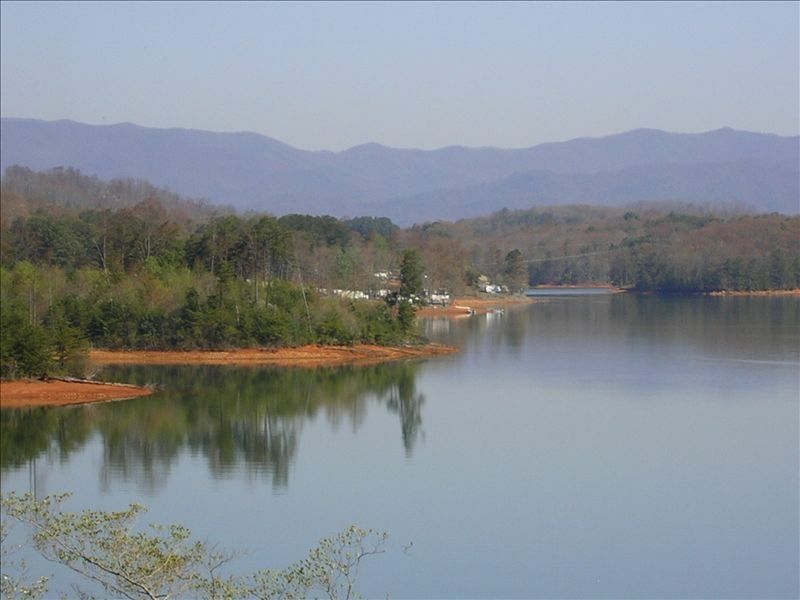 DON'T OVERLOOK THIS ONE or you will miss out on the almost new, quite,very clean and comfortable, and one of the best 2 bedroom, 1 bath, open living area with large wrap-around deck to enjoy the beautiful Lake Chatuge and mountain views. Upper driveway, no steps to climb. Wi-Fi access for your computer needs. Located near 2 championship golf courses, Brasstown Valley Golf Course and Chatuge Shores Golf Course. Also located within 1/2 mile of the Ridges Marina with lake recreational rentals. Lake access for swimming and boating within 150ft of house but no dock. No overnight tie-up. Peaceful location nestled in the center of numerous activities, such as the Georgia Mountain Fair with famous Country singers appearing throughout the year.Two arts & crafts shows are scheduled in the Spring and Fall. We are located close to Young Harris, Blairsville & Helen, GA with golfing, shopping, antiques, arts & crafts, and within 2 hours of destinations like Atlanta, Gatlinburg, Cherokee, Pigeon Forge, Asheville, Chattanooga and Knoxville. There are many activity's for young and old such as six movie theaters with current up to date movies and entertainment for the young only one mile away. We also have wireless internet. There are boat rentals at a marina 3/4 mile from our house and for those that are interested, there are now 2 "float planes" at the dock where you can rent a flight to see the lake and surrounding mountains. They do take off and land in front of our house which is pretty neat. Come & see what you've been missing! MAKE YOUR RESERVATIONS NOW BEFORE YOU MISS OUT ON A WONDERFUL SUMMER VACATION! We are a retired couple and enjoy meeting other people that want a nice place to stay that is very quite and comfortable. We built this house new on our property next to our house primarly for our family to stay in if they wanted to have privacy. New and very clean. Fantastic view, water access, No boat dock. Good swimming area with gradual slope. Very quite with almost no trafic. It does have lake access for swimming and boating. No dock. This place was absolutely perfect! The owners were helpful and friendly! Great view of the lake. Would love to go back during the summer months. I would definitely recommend this to anyone. Very comfortable. Rental had everything we needed. Owners were next door if we needed anything! Would rent again! This lovely cabin was the perfect spot for a time of quiet relaxation, We were blessed by the kindness and generosity of our hosts. I highly recommend this property. We thank you for the kind review. You will be welcome anytime that you would like to return. We do hope that you enjoyed our area and please return again. Super View and Location. Lodging was especially clean. Hosts were warm and inviting. My wife and I had an extremely nice weekend stay with Ruth & Glenn at their cottage rental overlooking a quiet cove on Lake Chatuge with Mountain vistas in the distance. The place was immaculate. Our hosts, Ruth & Glenn, were warm and inviting and more than willing to entertain and visit with us - like visiting your favorite Aunt & Uncle. Location was close to town (Hiawassee, GA) and easy to get to, but secluded enough that you didn't hear any road noise. We do enjoy retirement and love to be able to offer our location to people that want peace, quite, and to visit with new friends. The only thing that we can offer now is what we get to enjoy all the time. Extra effort is put forward to make sure that it is clean and comfortable so that we can help to eliminate negative thoughts while visiting ourdogwoodden. Please come back and visit with your new friends. It was a very comfortable home. It accommodated 5 of us along with 2 dogs. The owners were very friendly and accommodating. We would definitely recommend this property to our friends. These are fine, wonderful people that treated our home as if it were theirs. It was left very clean and in very good order. We would recomend them to anyone that they contact for a rental to be a very outstanding family. They are welcome back at any time to stay with us. We only wish that all renters were as nice, clean, and friendly as they are and we feel that we have met a new friend that we would not have met had we not had a rental. We have wireless internet for those that need it. All animals (dogs and cats)have to be approved by Phone. Large, long hair dogs are not approved. Phone Ruth for approval at 706-896-2723. Any animal that is left alone must be caged. No animal will be left to roam the house. These prices shown do not reflect the taxes,cleaning, or animals.